I mean, a Friday meal on a Monday. Do it do it do it. What fun things did you do this weekend? What kind of trouble did you get in to? I saw a gigantic floating rubber ducky that was so cute that I want to smash my face up against it or bounce on it like a trampoline. I ate pizza twice and we smoked three organic chickens in the new smoker that Eddie got for his birthday. FYI, I may never eat chicken any other way again. I was stuffing my face with chicken last night past my bedtime. We had what was possibly the most gorgeous weather of the last three months the entire weekend, and I can only say that because it dipped to the beautiful 60s once the sun went down. You know I love to live in a icebox. I want to buy all the sweaters on the internets. Every last one. I also had a complete cow over what TV shows to watch last night since Homeland made a reappearance, but figured that it might not be in Monday’s best interests to watch four hours of television past midnight. I did plop down on the couch for over an hour with my shrek-green face mask on and completely lost myself in the vortex of Facebook stalking. Seriously, will that ever stop? As long as ex-boyfriends and high school bullies exist, probably not. I wanted to eat donuts but didn’t. I wanted to drink wine and did. Major life decisions at the age of 30. Correct choices were made. One thing I didn’t do this weekend was make these nachos. I made them last week for late lunch/dinner one night which was really only supposed to be dinner but ended up being late lunch because I have zero patience and needed to eat the goodness immediately. Something else that will probably never stop. You know I’m all about the crockpot. This beef doesn’t take quite as long in the slow cooker as most recipes do. Of course, you can definitely leave it in there longer, it will just fall apart and be more like a pulled pot roast. Nothing wrong with that. I wanted to keep it slightly closer to the carne asada that I’m used to: thinly sliced. The awesome part is that this is ten thousand times more tender than any carne asada dish I’ve ever tried. It’s obviously not TRUE carne asada, which I’m pretty sure means grilled steak or something heavily barbecued. It’s not exactly that, but all of the flavor is there and more. And there’s, like, tons of vegetables on there! In a small bowl, combine the salt, pepper, paprika, onion powder, garlic powder, chili powder and cumin. 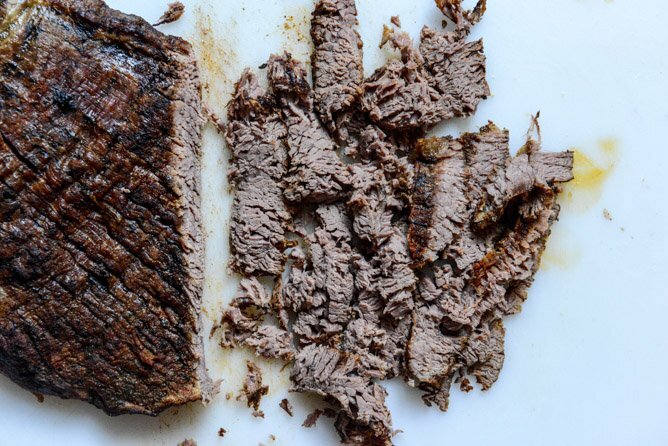 Whisk it together to create a rub, then evenly pat it all over both sides of the flank steak. Heat a large skillet over high heat and add olive oil. Add the flank steak and sear it on both sides until it is golden brown, about 2 minutes per side. Remove the steak and place it in the crockpot. Cover it with beer, then cover the pot and cook the steak on low for 6 hours. After 6 hours, remove the steak from the liquid and place it on a cutting board to rest for 15 minutes. Slice against the grain, cutting it into thin strips – it may be tender from the crockpot and fall apart, and that is fine. In a small bowl, mash the avocado with the lime juice, half of the cilantro and a pinch of salt. Set it aside. Layer the chips on a baking sheet or dish. Cover them with half of the cheese, then add the corn and the steak. Add the rest of the cheese. 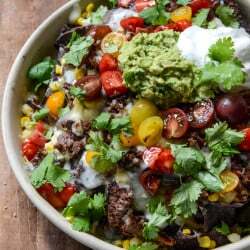 Turn the broiler in your oven to high, and place the nachos underneath, cooking only until the cheese is golden and bubbly, about 2 to 3 minutes. 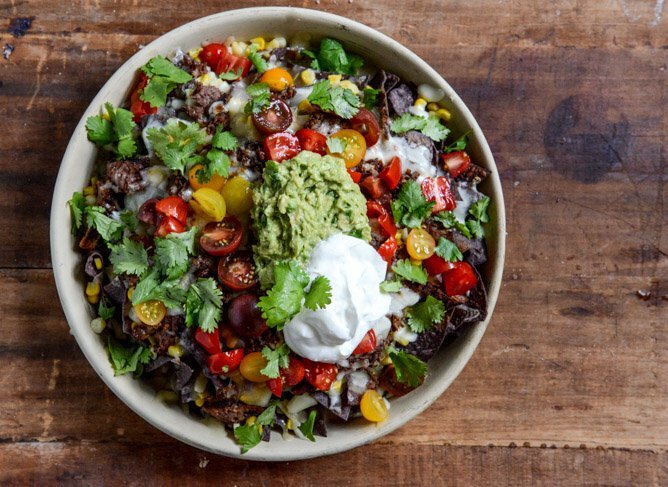 Remove the nachos and immediately cover them with the tomatoes, guac, sour cream and remaining cilantro. Serve! September Favorites: Food + Fun. OH MY GOSH!!!!!!!!!!!!!!!!!!!!!!!!!!!!!!!!!! I have to, have to, have to make this!! I am drooling over this dish! Looks amazing!! I really wish this was my dinner tonight. At the weekend I am definitely making this though. It looks incredible. Whoa! These look amazing. We definitely could’ve used these yesterday for the games! Guess there’s always next week, cheers! Amazing in every way and healthy to boot! Monday or Friday food? who care it looks too good! Yes, to nachos on a monday. Best idea ever! Mmmm, sounds like a winner! This would be great for the next football game we end up watching at home. I’m so glad you chose the wine over the doughnuts! I am so making this recipe this weekend- perfect football food! Umm ok, so that sounds like a pretty epic weekend! The rubber ducky was adorable. And smoked chicken? I don’t think I’ve ever had it, but now I’m craving it. Is it possible to crave something you’ve never had? Especially when it’s chicken and the time is 8:14am? Whatevs… and these nachos look awesome! I’m drooling over this – I might just have to whip out my crockpot… I have to find it first, of course. Yum, yum! Sounds like you had a great weekend, glad to hear it! GAH! You are a terrible influence. Says the girl whose house has smelled like caramel for three weeks. Let’s make every night taco night! Love the slow cooker aspect too. Lady, you nailed this one. Love this recipe — it looks delicious! oh so glad you got to see him too! These look really over the top good!! Yeah see I drank the wine last night AND watched the 4 hours of tv past my bed time and well, I think I need these nachos right this minute to bring me back to life! Died laughing at the TV comments, as I struggled with what to watch last night also. Alas, the Patriots were playing, so, as usual, my husband took over the remote. I swear I never get ANYTHING. But I did get this awesome looking recipe. Yum! Thanks! Oooh! Very intrigued by your new smoker, that sounds like so much fun. This looks awesome–I love one bowl dinners. Once again, all of these crockpot recipes are tempting me to buy my own (the one appliance I’ve resisted for years). But yeah, this looks AMAZING. Must try! yay now i can relive Mexico all over again! I can’t stop staring at these pictures. I want about 8 pounds of this in my belly NOW! I’m a vegetarian but this still looks amazing. You had me fooled for a second until a saw the meat underneath (and read that it was a recipe for carne asada). I am just going to make the top bit with the veggies! Wait until you smoke a turkey for thanksgiving using bourbon soaked wood chips and having brined it in a bourbon brown sugar soak. You’ll never roast a turkey again! This looks perfect to feed my hubby on game days! Love the easiness of the crockpot! I cannot possibly put into words how badly I need a plate of these. I got you beat girl, I had pizza 3 TIMES. Friday, Saturday Sunday. Not even a little sorry. I moved apartments though so I totally earned it. The rubber ducky was fabulous! were you there on Friday when you couldn’t even walk on the bridge? they had some amazing vendors – i picked up a variety pack of olive oils and vinegars from one of them… and fudge from another ;) not to mention the crepes! i may have to wait on these nachos considernig pulled pork nachos were my dinner 3 nights last week haha… but def another one for the bookmarks! 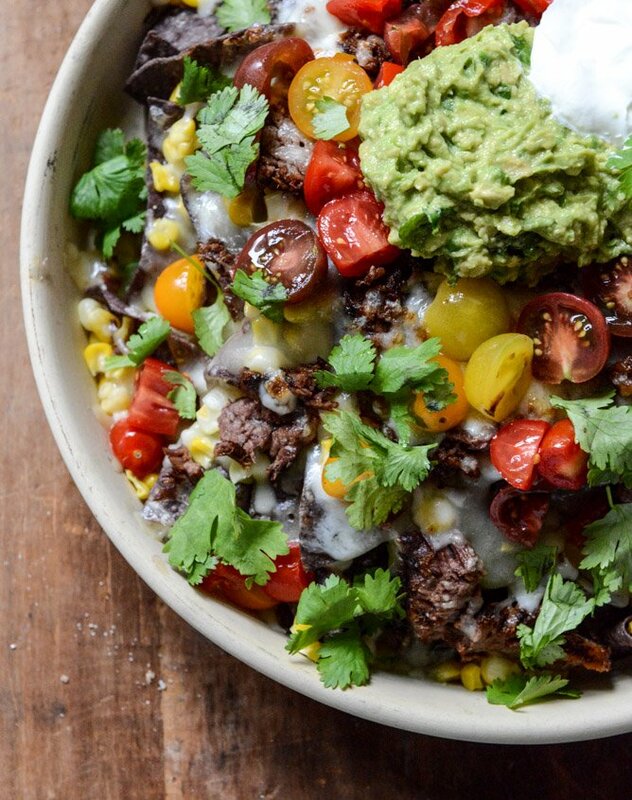 YES- these nachos on a Monday is totes for the win. This looks so freaking good. I don’t actually have a crockpot, but I’d be down with working this baby on the stovetop for a long and chilly fall afternoon. This looks so yummy.. and that guac! Can I just do a faceplant into that gorgeous bowl of deliciousness? I promise to have a napkin on hand for the afterwards. If these nachos for dinner on a monday night are wrong then I don’t wanna be right! there is never a bad time to each nachos. Omgggg I need to have this in my face. Like now. The colors are just beautiful and tis the season to dust off my crockpot! This dish looks AMAZING! Homeland is on my DVR. I can’t wait to watch it! Oh my gosh!! Get in my bellyyyyy!!! Your photos are always top-notch, but can I just say that these are exceptionally good? Especially the one with the sliced steak. Gorgeous! NACHOS ARE MY FAVORITE FOOD OF ALL TIME. I kid you not. I ♥ you so hard right now. Wow, I can’t believe how good this looks!! I NEED a crockpot! This looks like perfect Monday food! Sometimes a case of the Mondays deserves comfort food more than Friday! I no longer have a crock-pot and it’s recipes like this that make me sorely miss one!